Good afternoon ladies... Just got back from Harrison, AR, my wife had a DR's appointment. He changed her blood pressure meds. He ordered up a cat scan for tomorrow, so back to Harrison. She has a lump on the side of her neck that he's concerned about. I hope it's not serious, but won't know until after the scan. Dogs love tennis balls, lol. Cool little bird dancing on the ball. Have a great day everyone, and TY for the votes. I hope your wife's test comes out clear, Patrick. Will wait for you to let us know. Hello, froggy peeking out from his beautiful flower throne. No rain today, but still a little cold, Mary. Is it warmer there? Those doggies, always after a ball. 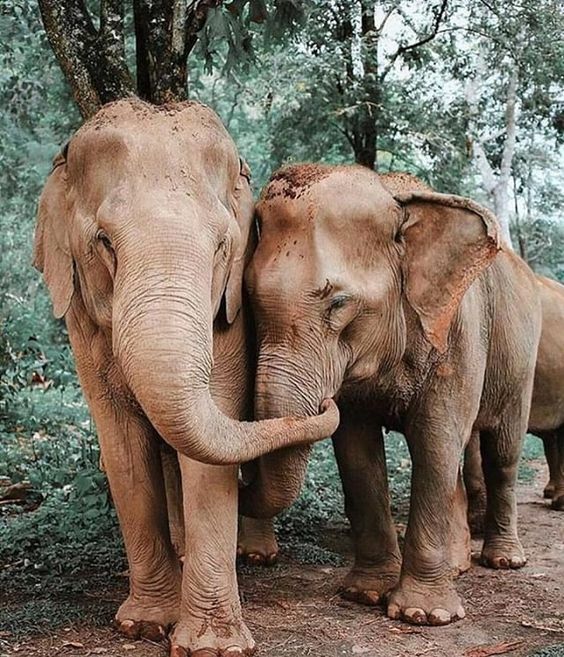 When ellies touch each others' trunks it's like holding hands. Glad warm weather is sticking around, Mandi. Buster is bossy to Ruby. His way of showing her love. I remember you telling us he tells Ruby to shut up when she is barking too much. BFFs 4ever. Apparently dogs aren't the only ones who like tennis balls, like birdie rolling on one, lol. Posting early today, getting ready for the drive to the hospital for my wife's cat scan. Thank you for your thoughts for my wife. It will be late getting back, so checking in now. Cool eles Mary,,, Jane is one of my heroes Ruth. That photo is prophetic. Have a great Friday and TY for the votes! Beautiful flower with frog Patrick and the hokey pokie bears LOL Sending lots prayers that all will be good for Karen. Mary, the eles are holding hands as Ruth said adorable. Ruth still a little cold eh? Sunny and warm here again. Jane Goodall is also my hero, Ellen show had her on not long ago.She is 85 yrs young. Good afternoon ladies. We never ended up at the hospital. Some cell phone discussions with the Dr's office, on the way, revealed that they would use iodine in the cat scan and the wife is allergic to iodine. So they changed it to an MRI, next Thurs. It would have been nice if they asked her a few questions before scheduling. If my wife hadn't been more astute, she might have had it with a really bad reaction. I hope everyone is having a nice Sat., stormy as well here Mary. TY for the cool pics and the daily votes. Jane Goodall is my hero also. She is a very strong influence for protecting, and saving wildlife, especially important for the children to carry on with conservation. When I saw the photo of her with toy monkey, I thought prophetic also. I'm glad Karen found out they use iodine for cat scan. Prayers continue for her MRI to be clear next week, and you, being her hubby. I hope storm passes through soon. The baby bears are so cute. I think they are doing the hokey pokey. Cheetah Mom is very busy with her six kids. Ahh, warm, and sunny weather, Mandi. Cold, and some times windy, but still feels like Spring, April showers. Jane is 85 years young. 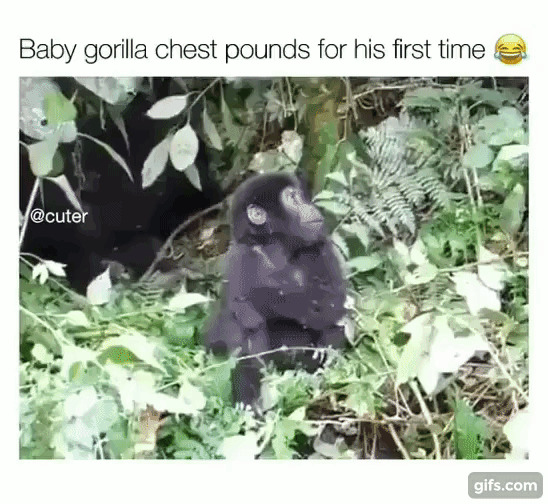 The baby gorilla is so glad to pound his chest, like the adults. Be safe from the storm, Mary. I hope it doesn't last till tomorrow. Very sweet baby. 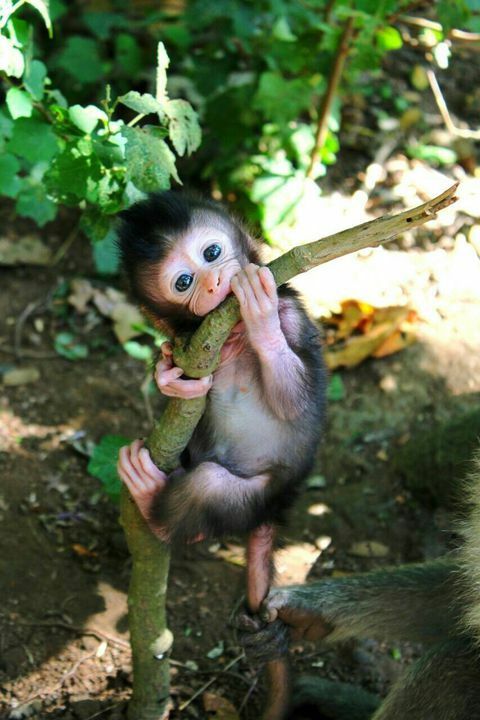 Mmm, that branch is yummy, or perhaps he's teething. Those are some cute kittens Ruth. I wonder how long they let those flowers stay on their heads. LOL I hope everyone is having a pleasant Sunday. It's chilly here, but the sun finally came out. There were snow flurries in northeast Arkansas last night/early AM. Too cold, too long. Hope this is the last of it. Have a great day and TY for the daily votes! Wow, sorry to hear about your bad weather Mary and Patrick. It' a good thing your wife told them about the Iodine allergy. You would think they'd have asked questions before making the trip :-( Let us know how the MRI is. Prayers all will be good. Voted. ! Love the pix Patrick. I don't see Ruth's post ?? Happy Sunday all. Sunny and breezy at 70 here today.